...Madball's back so just beware! Obviously saving up the right amount of money, the well-tought out decision of which record, and the long wait all added up to the excitement and made the record more valueable. Maybe that's one of the reasons why I still love Madball's Set It Off as much as I do, why I still listen to it on a regular basis, and why I know every single word by heart. Or maybe that's just because Set It Off is simply one of the greatest extreme music albums ever written and recorded. I dinstinctly remember putting this record on for the first time, and thinking it was such amazing music that the world needed to hear this and I wanted to share its greatness with everybody! I put the volume of my crappy CD-player at full blast, opened up the windows of my bedroom and figured my neighbours and the world would be instantly touched by this exciting music. Needless to say it was rather my parent's doorbell that got touched by the finger of many an angry neighbour. another life has been taken away. but livin' here you gotta learn. Get used to it, it's reality. Say your prayers, hope it won't happen to you. Mind your business, do what you gotta do. and what can you do, what can I do?" It has always been striking to me how an at that time barely 18-year old Freddy Cricien was able to capture this atmosphere so accurately in his song lyrics. 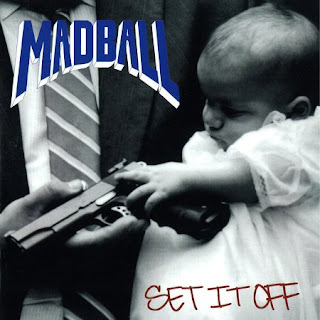 Don't get me wrong: I'll never fully grasp the feeling of how it is to grow up in such an environment as Madball grew up in, but saviour Set It Off's lyrics and feel what goes on behind this music, and Madball will slap you with a different kind of reality across your face. Acroooss your... face! I also love that they used only one picture in the lay-out, apart from the cover: a great bandpicture taken by B.J. Papas featuring Vinnie Stigma, Freddy Cricien, Hoya Roc, Will Shepler and Matt Henderson captured in their natural urban biotope. Other than that you'll find a collage of newspaper headlines displaying the New York City reality, accompanied by a little note saying that "at the time Set It Off was recorded (March/April '94) 264 people were killed by guns in NYC. That number has more than doubled since its release (approximately 2,5 months). STOP THE VIOLENCE!!!" There isn't much else I can say about record without repeating myself more than I already did. Just allow me to say that not only is Set It Off a seminal record, it is a document. A document of working oneself up from an urban, crime-ridden environment. A document about not getting caught into the traps and temptations that growing up in New York City exposes you to. A document about turning the bad things in your life into a good thing. This is something I've always tried to do and I thank Madball for that. Als ik niet zou opletten zou ik telkens ik Set It Off gehoord heb naar een tattoo shop willen lopen om de Madball bal te laten zetten. Ondertussen zou ik vol met zo'n ballen staan en ben ik siked dat ik niet zo stom zou zijn, want ik zou met zo'n tattoos (zelfs met slechts één) eruit zien als een douche. Net zoals iedereen die zo'n tattoo heeft. Eigenlijk, wanneer is dat gebeurd? Dat Madball tattoos voor douche bags geworden is? Bedankt M-town!